When Annie Selke was a little girl, she coveted a deluxe box of crayons. She didn't get it, and was forced to create her own more sophisticated color palettes. In high school, she developed an odd-couple love affair with the Colefax and Fowler wallpaper in her dorm at Miss Porter's School, which sparked a vintage-fabric-collecting addiction. It doesn't end there. A graduate of the University of Vermont and the Fashion Institute of Technology, Annie worked in PR, copywriting, merchandising, and product development for the likes of Saks Fifth Avenue, Ferragamo, Conran's, and the Museum of American Folk Art. In 1994, she founded textile company Pine Cone Hill working simply with an industrial sewing machine on her dining room table. Twenty years later, Pine Cone Hill has become a favorite of interior designers, Hollywood stylists, and home-decorating aficionados alike, and is handpicked for more than 300 magazine features and columns, newspaper articles, blog posts, online chats, and TV segments each year. Luxe is Annie's newest venture. A spin-off of Pine Cone Hill, Annie Selke Luxe is an exercise in subtlety and serenity, smooth to the touch and restful on the eye, offering the harmony and haven we long for. 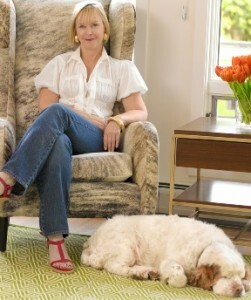 Curious to learn more about Annie's design tastes and influences? Consider reading her book, Fresh American Spaces.